We continued exploring the mysterious ship. The town authorities would soon remove the wreck and we had only a little time before the local salvagers would pounce upon the ship. It was difficult exploring the structure since most of the ship had been destroyed and it lay on its starboard side on the ground. We had almost given up on finding anything useful when we came upon a fully metal door which refused to budge. It was as if the ship's former crew wanted to hide something behind that door. The quartermaster got a blow torch and started his thing on the door. This is a time when several Italian eateries are mushrooming across the city. 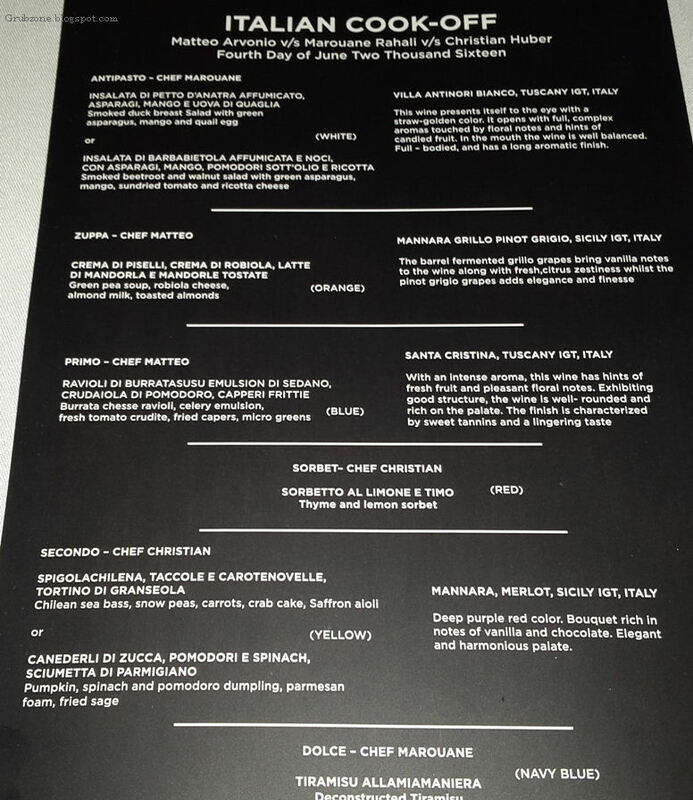 The menu is the same everywhere - Pizza adapted for Indians, Risotto, Pasta and some mains. But are these places truly Italian in spirit? That is the question. Mezzo Mezzo (MM) is like Italian royalty which stands high above the plebeian eateries we have grown accustomed to. This is not because MM sits inside the much acclaimed JW Marriott. It is because MM has Italian Chefs and refuses to change recipes to suit certain people. It serves Italian food as it is meant to be. I opened up my inbox last week to find a strangely captioned Email. "Battle of the Italian Chefs." it said. The mail talked about a multiple course meal prepared by three different Italian chefs who will also indulge in a friendly contest against each other for the title of the chef with the best dish. I have been many things, but never a cooking contest judge. Intrigued as I was, I accepted the invitation and waited for the day to come. Mezzo Mezzo has an ambiance which talks of old world elegance. 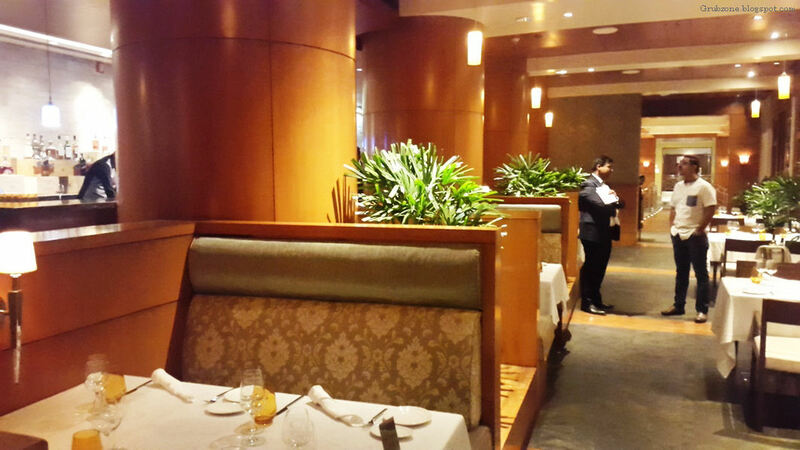 It is not flashy like the new generation restaurants but the ambiance and air speaks of a class above others. Simple, elegant and yet classy. The wooden feel is typical of older generation fine dines and it actually feels very similar to Marriott's atrium and lobby in decor. The place is really comfortable, a paragon of how fine dining should be. There were three chefs serving the table today. The blogger's table as well as the regular patrons of the restaurant had to vote for the dish they found best. While the cook off was for June 4 only, the fine dine set course experience is still available everyday. Let the Battle begin . Chef Matteo Arvonio vs Chef Marouane Rahali vs Chef Christian Huber. Ting Ting Ting. The menu. This was a five course meal with each course done by a different chef. Some chefs did more than one course. To keep things coherent, I will use English names wherever necessary. 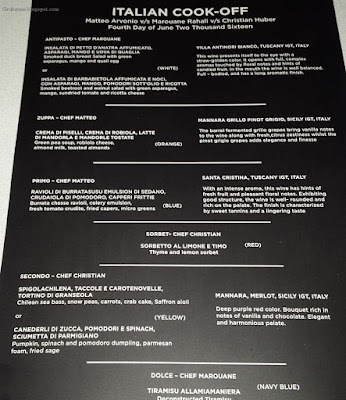 One can find the Italian names on the menu itself. Before the courses started, the resident sommelier gave us a quick run through of the wines paired with each of the courses. He gave a detailed explanation of why each wine was paired with the course. I think he would make a fine food blogger himself. The first course was the Antipasto by Chef Marouane. 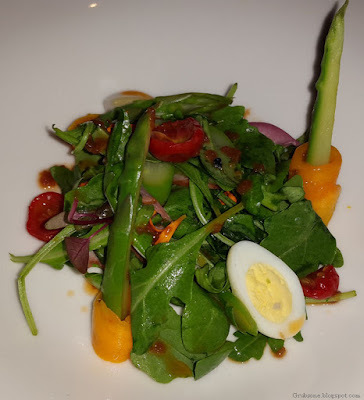 It was a leafy salad made of Arugula, Asparagus, smoked duck breast, quail eggs and mango. The freshness of the ingredients was clearly visible. The leafy flavors dominated the salad with support from the savory meat and a sweet twist from the Mango. Despite Mango not being Italian in essence, it had inherited the Italian flavors perfectly and had become a member of the family. T'was definitely one of the best salads I have ever had. The paired wine was Villa Antinori Bianco. This straw color wine had a very spring like flavor to it It was quite aromatic as well. Its flavor concerted well with the subtle flavors of the salad. The whole experience was like having a meal in the Italian countryside during spring with a babbling brook nearby. Second course - Zuppa. 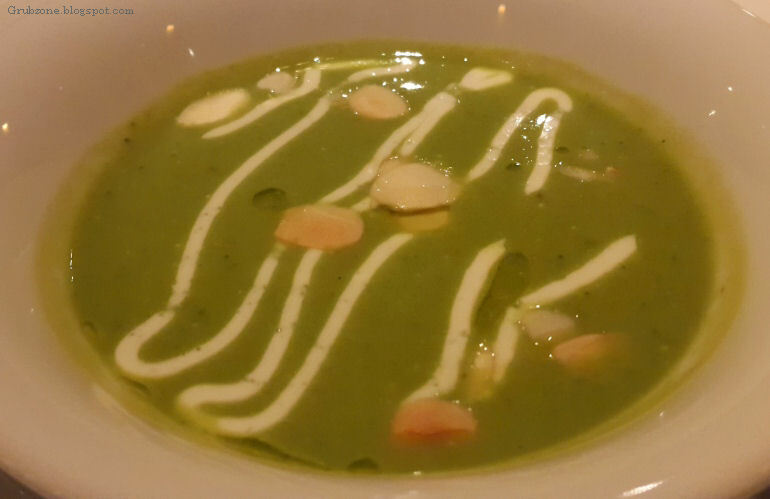 Crema Di Piselli by Chef Matteo was a soup made out of green pea puree, almond milk and Robiola cheese. It was also peppered with fine almond flakes. The soup had an earthy aroma. The flavor was creamy with the almond milk and pea perfectly blending together. I am not usually fond of meatless soups but this was the epitome of fine dining. The soup's flavor raised my spirits. It was perhaps one of the best soups I have ever had. The soup was paired with Mannara grillo pinot grigio. This light Sicilian white wine added to the earthy sensations created by the soup. At this point, I could tell that the sommelier knew his stuff well. Quarter Master : Aye, here she comes. The door is now open...Sort off. Captain : Get a light. Lets see what is inside. First Mate : I hope its Rum. Hundred year old Rum. Captain : So should we drink it or sell it? Third Course - Primo. Ravioli Di Burratasusu (also by Chef Matteo) was a Burrata cheese ravioli which was served with a bit of Ricotta. The flavor felt slightly chalky at the start but that soon morphed into a cheesy savory flavor. The transition of flavors felt quite exciting. The flavor was quite addicting and Italians once again prove how they are the masters of both meat and meatless grub. I personally found both of Chef Matteo's creations amazing. All three chefs were amazing but for me, Matteo was the winner ha. This was paired with Santa Cristina. This powerful wine had hints of fresh fruit and floral flavors. 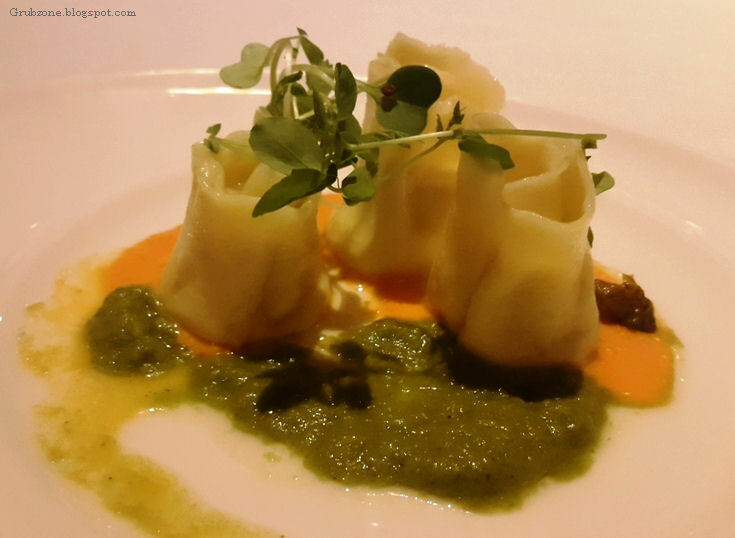 The flavor tends to stick for a while and it lends a very spring like theme to the Ravioli. The sweet tannins complemented the savory cheeses well. Captain(Explores Room) : Good Calypso. So many charts. First mate : Its not possible that this ship could have been to that many places in one life time, especially hundred years ago. Captain : These charts seem to be drawn by the same navigator. They are all signed AS. First Mate : AS? Could it be...her? Before the main course, I was served with a lemon and thyme sorbet which acted as a palate cleanser. Fourth Course. Secondo. Chilean Sea Bass by Chef Christian Huber was served with savory crab cake and decorated with carrots, snow peas and a bit of saffron aioli. 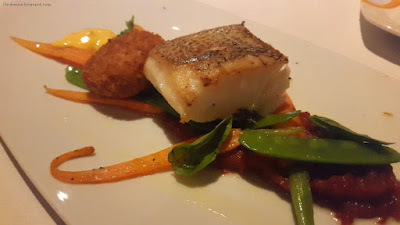 This cut of Patagonian toothfish(Real name) had a salty savory skin and a gooey basa like interior. Though not as flavorsome as the dishes that preceded it, this was still satisfying grub. This was paired with Mannara Merlot. This deep purple red wine was sweet and acidic enhancing the flavor of the toothfish. Its strong acidity resonated well with the gooey fish interior. The Final course, Dolce. 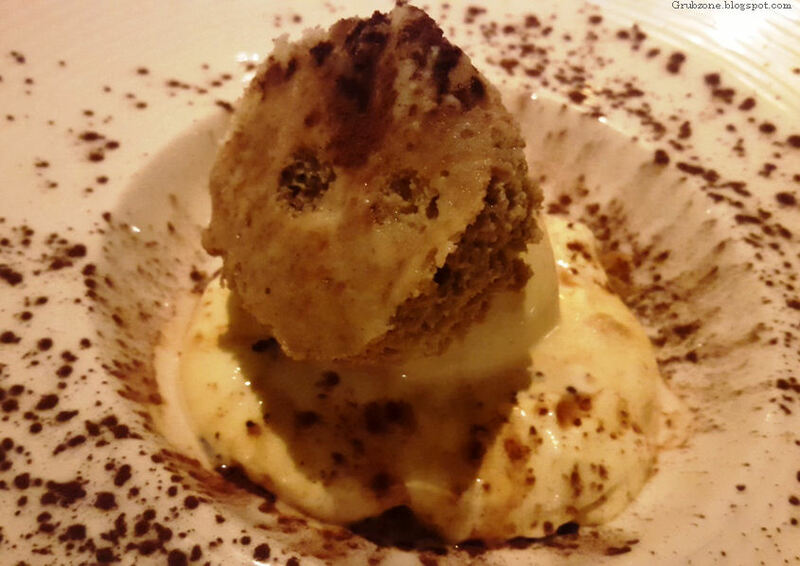 Deconstructed Tiramisu by Chef Marouane. There are few people who can get a deconstructed dessert right. It is after all much more than simply taking a dessert's constituent parts and dumping it together. Chef Marouane was one of those who got it right and to perfection. While the dessert did not look very aesthetically pleasing, the flavor was enchanting. 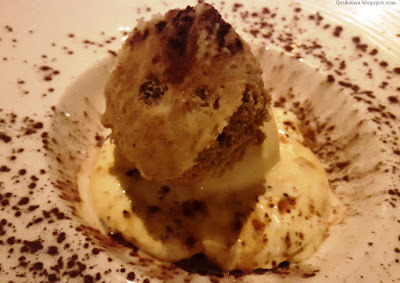 This was made of Mascarpone, ice cream, shortbread biscuits and coffee powder. Eating any two ingredients together would create a delectable alchemy in the mouth. Shortbread and Mascarpone, Shortbread and ice cream, Ice cream and mascarpone or all three together. There were so many depths of sweetness and so many variations of sweet. A dessert like this is not easy to achieve. Also as a footnote, this was made of relatively healthy ingredients and was gluten free. Not surprisingly, the dessert won over the other dishes ha. Captain : Could it be Arianna Silvers? First Mate : Must be her. Only she was capable of making so many charts. Captain : We are on a ship which was once navigated by THE Arianna Silvers. First Mate : No one knew what happened to her. She just vanished and became a tale of legends. The meal, the pairing and the fine details involved in each dish made this battle quite a tasty one. Mezzo Mezzo was an amazing experience in totality. I would love to come here again someday. The biggest obstacle between me and Mezzo Mezzo is the distance. Hopefully someday there will be a way to bypass the dreaded Juhu Tara road which gets crowded by tourist vehicles. The service was exemplary as expected from an institution within Marriott. The staff was properly trained in serving and wine etiquette. The sommelier's brief at the start also enriched the experience. This was truly first class fine dining. I cannot really comment on the pricing as it was a special bloggers table but the pricing is expected to be high. The quality of ingredients, expertise and the experience are worth every penny spent. This was definitely one of my best meal experiences as a blogger and food writer. I would surely visit again in the future and construct my own five course meal the next time. Finally, if I were to choose a winner - It would be Chef Matteo Arvonio. Both his creations were amazing. And his soup was among the best I have had. Captain : Our work here is complete. Lets leave before the salvagers fight us for these charts. Quartermaster : These charts would be worth a fortune if we sell them in the black market. Captain : Imagine the fortune that could be found using these charts mate. We will trace all of Arianna's voyages and find the fantastic things she found a hundred years ago. This is a great discovery lads. I can't wait to sail out. Barbeque Nation - Hill Road, Bandra West, Mumbai. Yauatcha - Bandra Kurla Complex, Mumbai. Cafe Cubano - Kemps Corner, Mumbai. 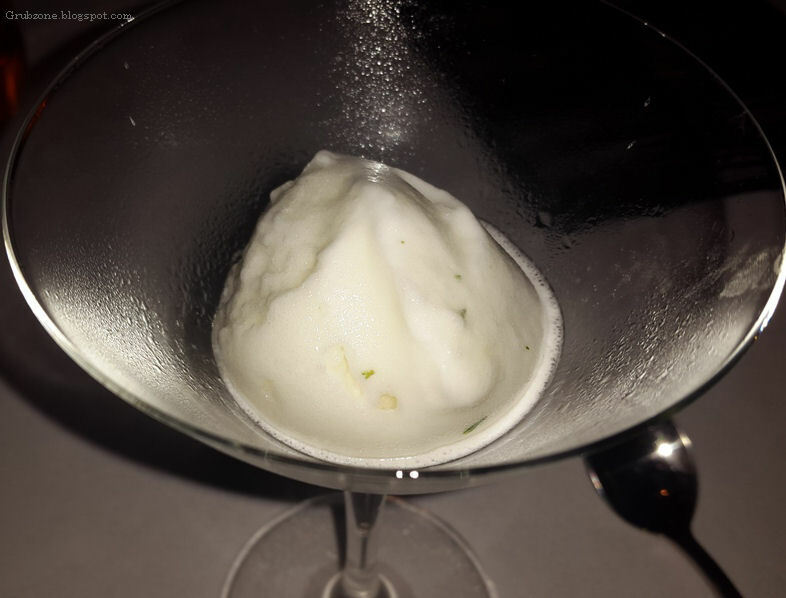 AKA Restaurant - Worli, Mumbai. China 1 - Bandra Kurla Complex, Mumbai.